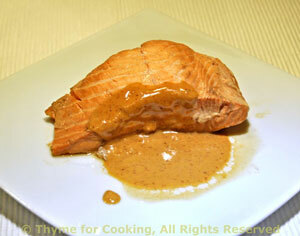 Red-Cooked Salmon with Peanut Sauce, quick, easy gourmet dinner. 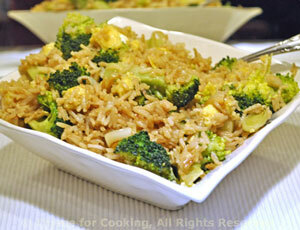 An easy, Chinese dinner to start the week-end. 'Red-cooked' refers to a Chinese technique of poaching or braising in soy-sauce based liquid. Salmon is not a typical fish in Chinese cuisine but it worked very well. Add the soy sauce, ginger, vinegar and water to a skillet just large enough to hold the salmon easily. Add the salmon, curved side down, cover and bring to a simmer. Simmer slowly, bubbles barely breaking the surface, for 15 minutes, carefully turning the salmon half way through. At this point salmon should be cooked through, flesh opaque. If not simmer another 3 - 5 minutes. Remove from heat and let rest, covered until ready to serve. Remove salmon to plates, spoon sauce over and serve.